Pureed smooth, it’s like velvet. Served thick, it’s a like a hug… if hugs and velvet actually came in steaming bowls of deliciousness ;-) How can such simple ingredients make such a soul warming soup? Toss the potatoes and onions with salt, pepper, and a couple tablespoons of olive oil. Spread them in a single layer in baking pans (or a single pan if you have one big enough). 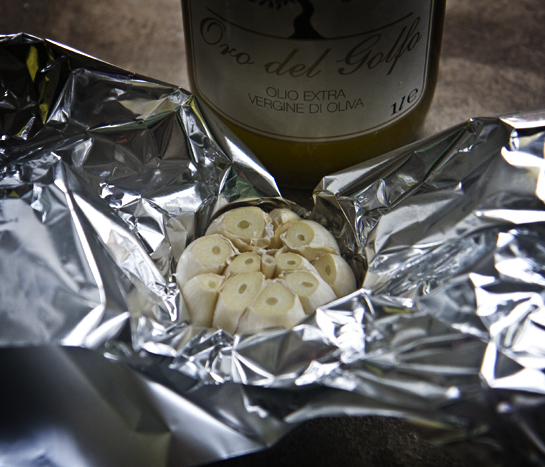 Remove the outermost layers of the garlic bulb’s skin and slice off the end to reveal the cloves. Wrap foil around it, drizzle it with a teaspoon or so of olive oil, then wrap it tightly and tuck it into the side of one of the baking pans. Bake the potatoes, onions, and garlic at 400 degrees for 30 – 35 minutes, or until the potatoes and onions are tender. Don’t forget to stir them a couple of times. Let them cool a bit so they’re not nuclear hot. 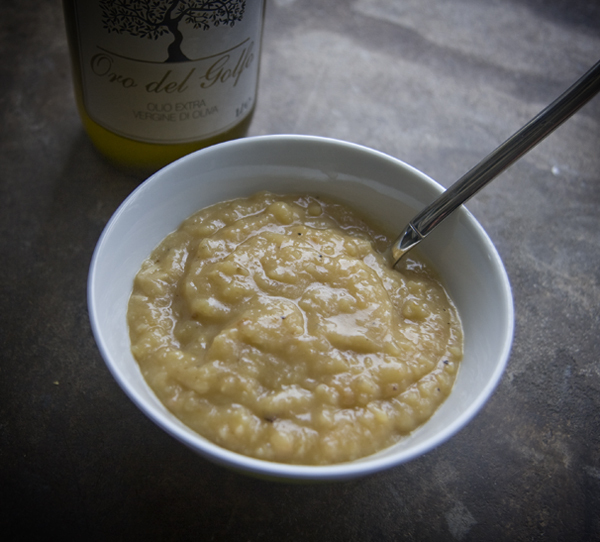 If you’re going for the velvety version, puree the onions, potatoes, and garlic (it should squeeze easily out of the skin) with all but 1 cup of the veggie stock in small batches in a blender until they’re smooth. If you’re going for the thicker version, use a food processor to pulse it a few times, maintaining some of the texture of the veggies. You can also opt to sit tight until the end and finish it with an immersion blender. Melt the butter in a soup pot, then stir in the flour, and stir, stir, stir until you’re got a smooth roux going, then whisk in the cup of veggie stock. Once that’s all smooth and lovely, add in the pureed veggies. If you’re going the immersion blender route, add the potatoes, onions, garlic, and stock, then blend it until it’s a consistency that makes you happy. Finally, stir in the creme fraiche, heat it through, and you’re done! This sounds very good. Thanks, I will have to give it a try someday this winter when the wind is blowing hard and I need something hearty and soothing. Perfect timing. I bought a bunch of potatoes this weekend with the goal of doing some sort of potato-based soup this week to combat the cold. Yum!